"Near future noir crime fiction"
Homicide detective Jack Dillon investigates the murder of his ex-girlfriend Kate Riley. As he follows the trail he will be confronted not only by corruption and conspiracy, but by his own past. What he discovers will threaten to bring down a major corporation and they will stop at nothing to keep him silent. Full Dark City has not been tagged yet. 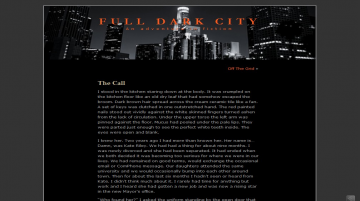 Help others find Full Dark City by tagging it! Full Dark City has not been reviewed yet. Full Dark City has not been recommended yet.